The Stroud Trail Marathon and Half Marathon are a fabulous & challenging mixture of local trails, Cotswold hills, famous Towpaths, disused Railway Tracks, nationally acclaimed Common Land and of course the amazing views on the Cotswold Edge all in an area of outstanding natural beauty. 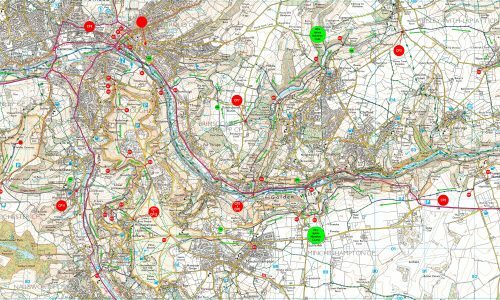 From the start of the Stroud Trail Half, the route leaves the town centre and heads westward onto the Severn-Thames Canal towpath, past Ebley Warf, Stonehouse, Ryeford and on to Ocean Bridge (Checkpoint 3.5M). The route leaves the Towpath and turns towards King Stanley, via Stanley Mill and over Ryeford East Road and onto the Old Cotswold Way. This is the beginning of a long ascent up onto Selsley Common, via Manor Farm, Middleyard (Checkpoint 5.9M) and up into Pen Woods. The route now joins the old disused Stonehouse to Nailsowrth Railway line (aka the Dudbridge Donkey Line) and heading towards Nailsworth. After about a mile, Dunkirk Mill comes into view and now leaving the Cycles Track, the next 600ft ascent is here to take runners up onto Minchinhampton Common and over to Amberley, (Checkpoint 11.1M). 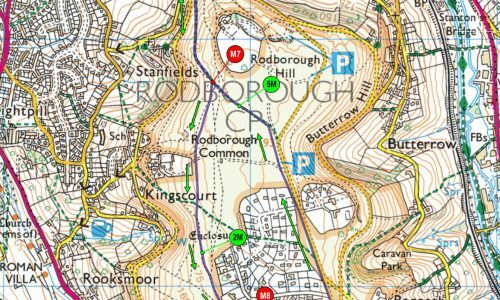 So heading across Minchinhampton Common, the course steers past the Bear of Rodborough Hotel, across to Rodborough Common and back to Rodborough Fort. The route now takes a steep descent from Rodborough Common towards Stroud, under the Railway Viaduct and onto the Thames/Severn Canal Path, west along the Towpath and into the Town Centre to the finish. 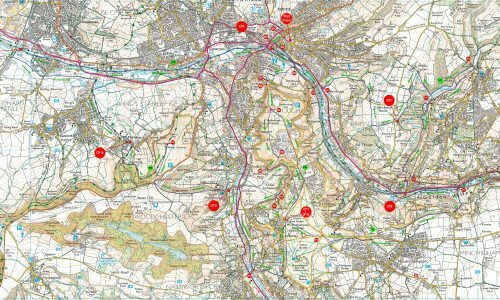 From the start of the Stroud Trail Marathon, the route leaves the town centre and heads eastwards on the Severn-Thames towpath, up to Rodborough Common. Then through St Chloe’s woods and onto Amberley (Checkpoint 3.9M). The Loop in Toadsmoor Valley takes in some stunning variation of scenery, from lakes, woodland & hidden gems of the Cotswolds. The route goes from Lower Bourne, through Stringers Woods and over to the east of the Toadsmoor ponds, before heading back through Toadsmoor Woods just below the village of Eastcombe. Following the Streams to the biggest of the ponds before a magical ascent to Middle Lypiatt. 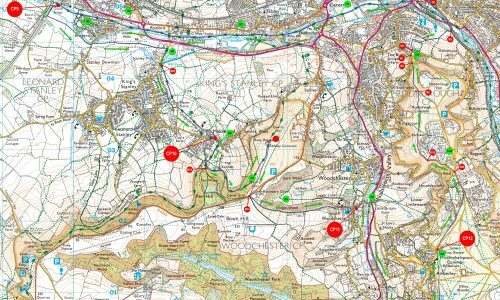 Once on top the run now goes through Mackhouse Woods to, Quarhouse Lane, (Checkpoint 9.9M). Following on from here the marathon runners go across to the Heavens, before descending through Dry Hill Wood. Now the course meets the towpath at Bowbridge Lock again, to head back into Stroud to pick up the Half Marathon Route (Checkpoint 12.3M). UKA affiliated athletes and other Club members may be required to prove their Club Affiliation by showing their UKA licence or other respective ID at registration. Please remember your licence otherwise we may have to charge you the additional unaffiliated £2 on the day. Your Bib, which is also your timing chip, must be worn on the front of either your vest or shorts and must be visible at all times. If covered up it may not get registered on the Start/Finish line. Please assemble by the Start Line 10 minutes before your race time for a compulsory safety briefing, which will give you the latest update on the course and any issues you need to be aware. The Race permit for this event strongly advises that runners do not wear personal headphones/earphones to listen to iPods, MP3 players, smartphones or other personal music players whilst participating in the event. Why? Running whilst wearing headphones/earphones significantly reduces your ability to hear traffic, individual vehicles, instructions and warnings from the police, marshals and other people, and generally distracts your attention, increasing the risk of accident or injury to yourself and possibly other people. If however you choose to participate in the event using such a device you accept full responsibility for your own safety and for the safety of anyone else who may be affected by your acts or omissions. NOTE: You must remove your ear plugs completely when approaching a Road Junction or Crossing and you will be disqualified if you don’t adhere to this request. Follow sign for Stroud A419 and after 11 Miles from Cirencester you will reach Stroud, take a left onto Stroud Bypass/Dr Newtons Way. At the roundabout, turn right towards Cheltenham. The trails have a wide variety of terrains so please bear this in mind when preparing your options for the day, as well as taking weather conditions into account. We want you to have a great running experience, however, if you feel unwell before the start please seek medical advice, do not take part or or if you still wish to take part then please check your fitness and look at www.runnersmedicalresource.com for information and advice related to running events. Please give yourself plenty of time to arrive, park and register. The last thing you want on event morning is to panic because you are running late (pun intended). We would suggest one hour before your event start time. Are the marathon and ultra self-navigating? Hey there, just to let you know that the course will lined with checkpoints which will be marshalled. The course will not be lined the entire way but you will not need to self-navigate. All the best! Test your bravery, endurance and mental strength with this multiple distance obstacle run with opportunities to collect stars and place them in your bag, at the finish you will count stars out of your bag which determine what medal you receive. 10K, Half Marathon, Marathon, Ultra Marathon. The Devil's Challenge is a 97 mile ultra marathon that takes place over 3 days along South Downs Way. The course begins in Winchester, Hampshire on the first day; passes through South Downs National Park, pre-historic sites, and small villages; and finishes in Eastbourne in East Sussex on the third day. Challenging enough in itself, this race is perfect for those who want to experience an incredibly scenic ultra marathon, or it is a great training event for those who are participating in other multi-stage events. HEINEKEN Race to the Tower is an unforgettable challenge. The double marathon takes you through the pleasant rolling hills of the Cotswolds, passing though small towns and past impressive historic landmark features. There are multiple ways to take on this challenge. Conquer the full route in one go (52.6 miles), or break it up and complete a marathon each day with a fun night of camping in between. The Cranham Beast 10k & Baby Beast 3k are trail events which takes in some of the most hilly, but beautiful, and stunning parts of the Cotswolds. The event gives runners and walkers the opportunity to explore fantastic commonland, diverse woodland, the famous Cheese Rollers Hill (Coopers Hill), get spectacular Cotswold views and visit local villages such as Sheepscombe, Witcombe, Birdlip and of course Cranham. Oh the fields of joy, great views, lots of fresh country air, hardly worth mentioning the uphill! A run in beautiful Cotswold countryside on the edge of Kings Stanley, through Middleyard and elevates you to the top of Selsley Common with spectacular views. Both Selsley Sizzler & Little Sizzler runners will be starting from the Kings Stanley Village Green, and complete a 3/4 lap of the green, before disappearing down some woodland steps into the trees, to join the Cotswold Way headed towards the Stanley Mills.